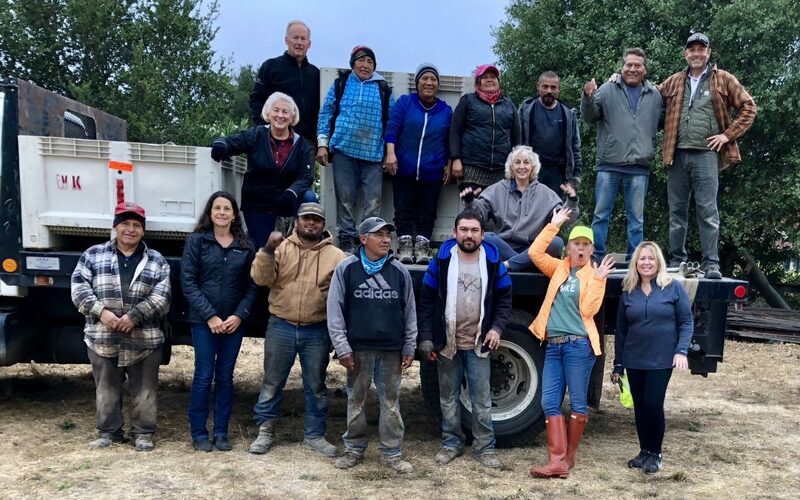 Featuring an incredibly lovely and fun couple from New York, and their very authentic Italian patriarch, Pasquale, (bottom row, second from left), these clients celebrated their 3rd harvest of mountain-terraced “field blended” Cabernet, Sangiovese, and Zinfandel. This fruit was harvested in the early morning hours and rushed to the winery to be turned into a singular ‘estate’ wine. Available for sale in 2019! 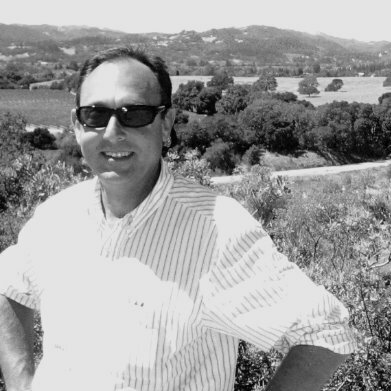 Hailing from San Francisco, with children, aunts, and uncles all pitching in, this new client recently acquired their steep 100% hillside Sonoma Mountain Cabernet vineyard (which we have been farming for three years for the prior owner). 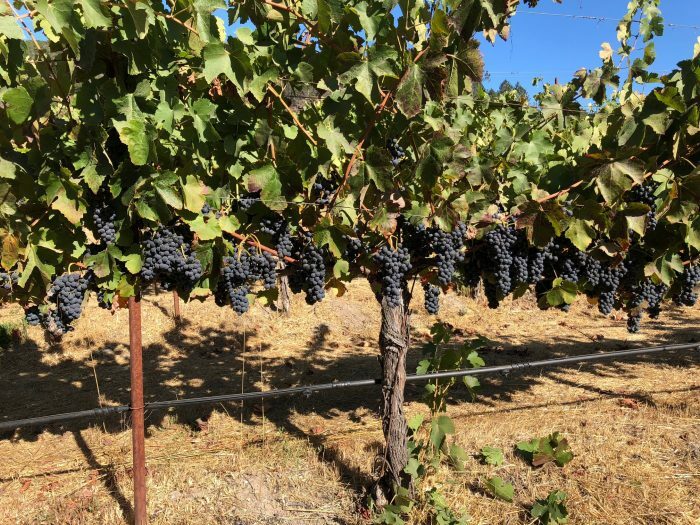 As you can see from the white 1/2 ton bins, this vineyard yields spectacular dense fruit that delivers a classic Sonoma Cabernet. Inky, full of dark fruit, and soft silky tannins. Available for sale in 2020! 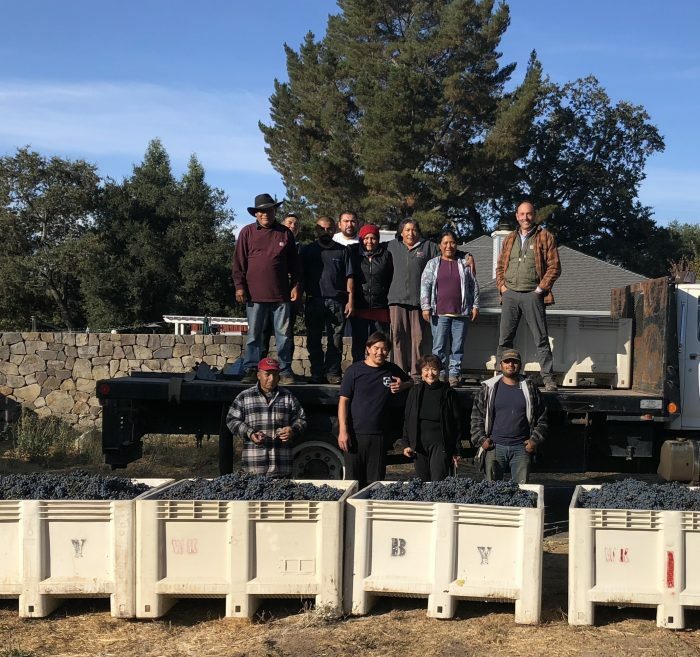 This very creative son-and-matriarch team (middle of bottom row) from the island of Hawaii standing in front of their harvest of 12-year old Napa Cabernet from their ranch near Monticello Road This harvest produced a yield of almost 5 tons of deep dark inky opulence. The fruit will make a highly-customized Napa Cab. Available for sale in 2020. 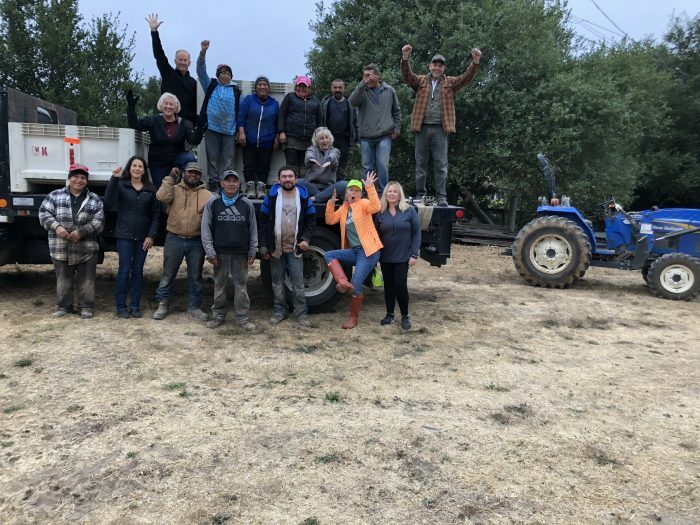 And this rag-tag crew of wonderful family, friends, and the Hydeout Sonoma farming team (plus a special shout-out to the Kansas City-based picking crew!) 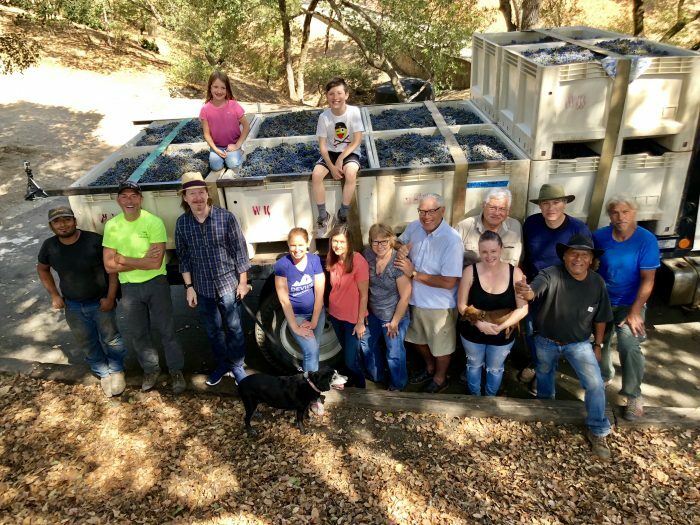 helped harvest the very 1st vintage of Hydeout Sonoma’s “Sagrantino” (from our 11-acre Carneros ranch, a 100% Umbrian red varietal) and also the 2nd vintage of our Dysfunctional Family Winery “Red Blend.” Dysfunctional Family will be available for sale in 2019. And the “yet-to-be-named” Sagrantino will available in 2020. 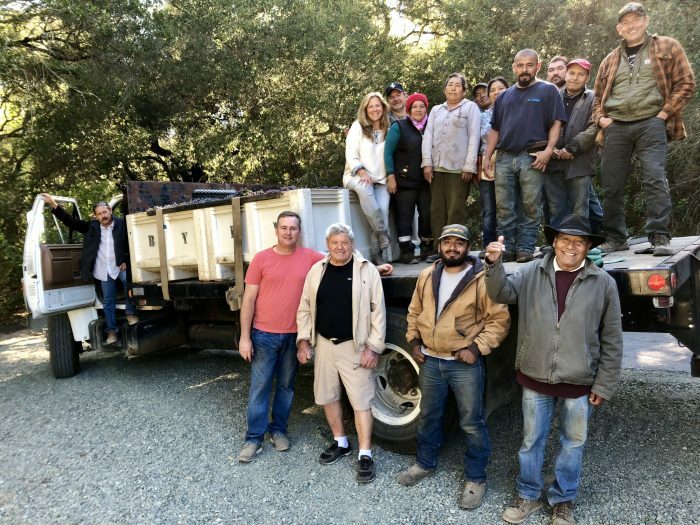 These good fellows (client, father-in-law, and uncle) worked very hard to help us harvest their family’s Cabernet grapes starting at 6:30 in the morning, then followed us to the winery to observe the fruit being meticulously processed. And then they hustled back to cook a spectacular steak-and-potato harvest dinner. 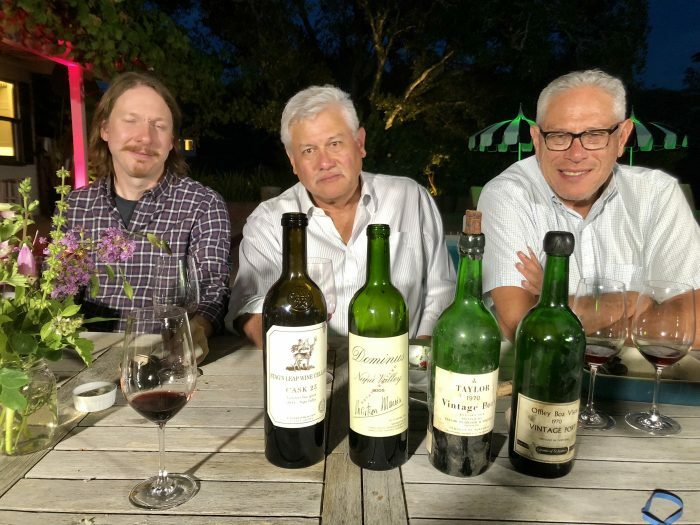 When I arrived, the sun had already set, but the corks of these four special wines were just being pulled and generously shared! My loyal and true partner through the entire farming season and harvest, Señor Tacho Enriquez, carefully looks after our people and farm equipment. Here he is being supervised by our “Buho Jefe”, Hydeout’s pet owl. 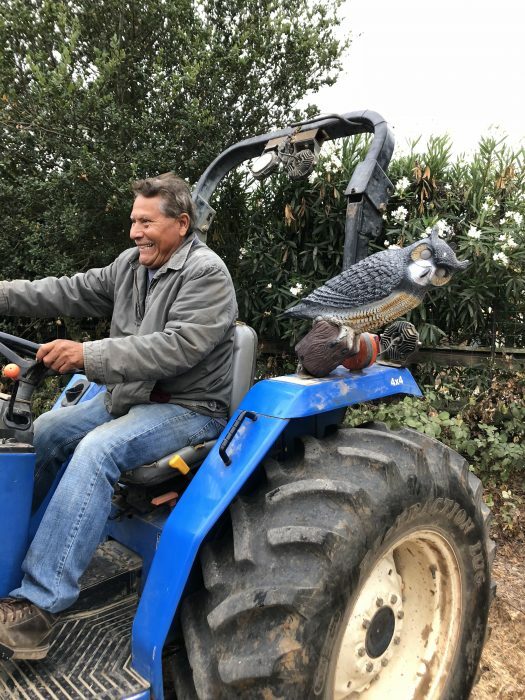 This plastic owl is supposed to keep birds out of the vineyard. It doesn’t. But it’s fun to have around. Once the fruit is fermenting, it’s time for pump-overs and punch downs. 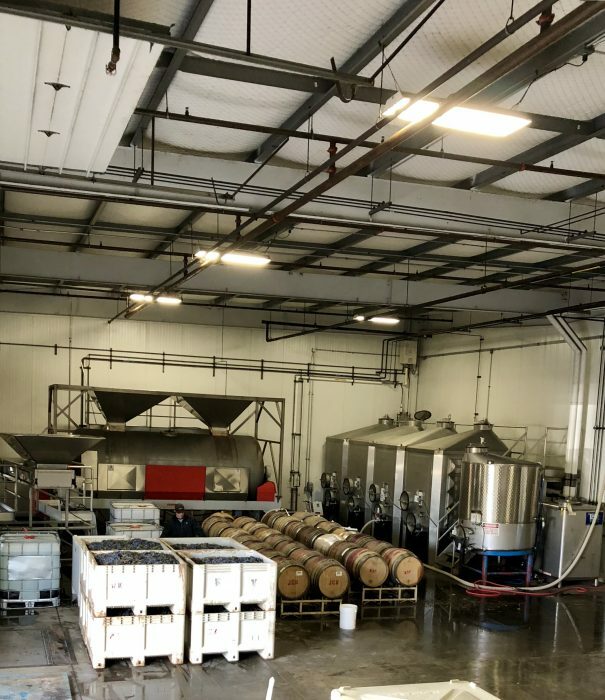 After the fruit is destemmed, moved into the fermentation tanks, cold soaked, and finally inoculated with yeast, the grape skins start to rise to the top of the tank (see the organic chemistry note below for more info). 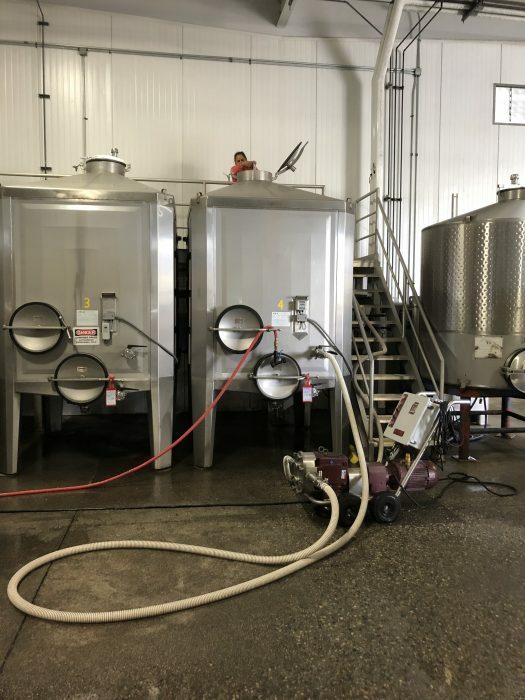 Two to four times per day, every day, we pull the juice from the bottom of the tank and ‘pump it over’ the top – this pushes the grape skins back down into the liquid must (see the white hose coming from the lower part of the tank, into a pump, then up the stairs to the top). In smaller tanks, this is done from the top by manually pushing down on the skins, and is called a ‘punch down’. 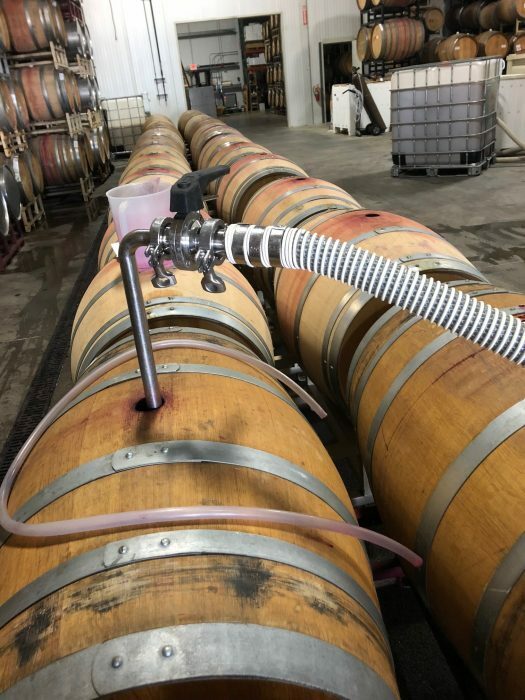 As the skins are forced down into the liquid, and as alcohol slowly accumulates, the alcohol acts a ‘solvent’ soaking the polyphenols (tannins, flavonoids, color, and body, etc) from the skins into the wine. Managing this process carefully is part of what makes a good wine great. Note: Yeast will convert sugar into alcohol at a ratio of approx 62%, the remaining 38% of the equation becomes CO2 and heat. The heat and CO2, in gaseous form, rises in the tank taking the grape skins with it. Thus the need to ‘pump over’ or ‘punch down’ the skins back into the fermenting juice. Impressive activities and range of varietals. Good luck with your amazing clients. Looks like you had a great crew!! And Lynn is very enthusiastic! Thanks Ken for sharing and filling in what you do for this Beginner 101. Everyone in grape-world is fortunate to have you working by their side.